The M.O.M. Immunodetection Kit contains enough stock reagents to produce about 25 ml of working solution which is generally sufficient to stain approximately 250 tissue sections. The M.O.M.® Immunodetection Kits are specifically designed to reduce endogenous mouse IgG staining when using mouse primary antibodies on mouse tissue. The inability of an anti-mouse secondary antibody to distinguish between a primary antibody produced in mice and the endogenous mouse immunoglobulins present in mouse tissue results in high background staining which obscures specific staining. This problem can be essentially eliminated by using an M.O.M. Kit. The result is clear, crisp specific staining of the antigens of interest. The M.O.M. Basic Kit contains a proprietary Mouse IgG Blocking Reagent and an M.O.M. 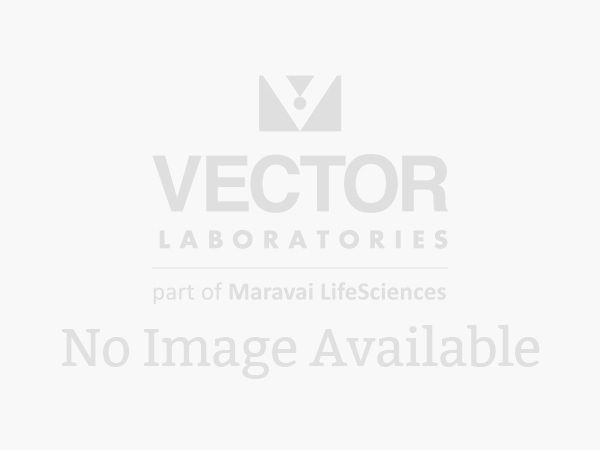 Biotinylated Anti-Mouse IgG reagent and is based on the simple and easy to follow avidin or streptavidin/biotin reagent protocols; no tedious calculations or antibody pre-binding steps are required. Excellent staining results for a once difficult application have now become routine with the Vector M.O.M. System. The M.O.M. Immunodetection Kits are useful in any mouse-on-mouse application, such as studies in genetically engineered mice, including transgenic and knock-out models, as well as mouse xenografts. The M.O.M. Kits can be also used in multiple antigen staining protocols to localize two different mouse primary antibodies on the same mouse tissue sections using fluorescent or enzyme-based detection systems. Detailed information for multiple antigen labeling can be found in our brochure, "Discovery Through Color: A Guide to Multiple Antigen Labeling" , available on our website. Four M.O.M. Kits are available. The three kits based on avidin/biotin technology use the same proprietary M.O.M. Mouse Ig Blocking Reagent and the M.O.M. Biotinylated Anti-Mouse Ig Reagent, but offer a choice of an enzyme-based or fluorescent-based visualization method. M.O.M. Mouse Ig Blocking Reagent and M.O.M. Biotinylated Anti-Mouse Ig Reagent are also available separately. The M.O.M. ImmPRESS® Kit contains our proprietary M.O.M. Mouse Ig Blocking Reagent paired with a specialized, ready-to-use, one-step, non-biotin M.O.M. ImmPRESS Peroxidase Polymer reagent. An enzyme or fluorochrome conjugate is not included allowing for a choice of any avidin or streptavidin-based detection system. Choose any peroxidase or alkaline phosphatase conjugated avidin or streptavidin for chromogenic detection (for example, VECTASTAIN ABC-AP Standard Kit followed by a Vector alkaline phosphatase substrate), or choose a fluorochrome-labeled avidin or streptavidin. This M.O.M. kit contains sufficient stock reagents to provide approximately 25 ml of working solution, which is usually enough to stain about 125-250 mouse tissue sections.